Bankruptcy can sound scary. It’s the thing you’ve heard about people doing but never actually considered for yourself. What is it even about? How do you go about filing for it? These are all questions you ask yourself when considering bankruptcy as an option for your own financial situation. As you do your research on the matter you’ll come across a lot of experts that claim they know what they are talking. Unfortunately, this isn’t always true and half the time this is how myths are born. 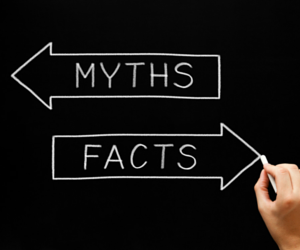 Here are the top 5 myths that surround bankruptcy, set straight. No, you will not get rid of all your debt when you file for bankruptcy. Filing for bankruptcy does not pardon you from certain debts. These debts can include child support or alimony that you may owe to a spouse, student loan balances, charges brought about by criminal acts, and any fraudulent debt that you may have incurred. Bankruptcy can however wipe out any credit card debt or unsecured debt. The definition of unsecured debt is any debt you have that no one has a hold on personal property for. This means if you fail to pay the debt the creditor can’t take the thing you are paying on. Examples of secured debt would be your house or your car, these items can taken away from you if you fail to pay the bill. A common misconception of debt is when you file the government will take everything you own including your dog. This simply isn’t the case. In the state of Minnesota, you can keep every day household appliances such as radios, televisions, phones, or computers as long as they don’t exceed $7200 in value. You can also keep food, utensils, clothing, and other personal effects up to $9300 in value. Don’t worry your home isn’t in danger either. You’re allowed to keep up to $200,000 in equity in your personal property. This applies to a home in the city on less than an acre and a home out of the city on no more than 160 acres. On motor vehicles you’re able to work with the institution that is doing the bankruptcy to figure out if you will be continuing to pay off the car, or if it will go back. Filing for bankruptcy doesn’t mean you will lose everything you own. If you have any questions about a specific item you feel might not qualify be sure to ask your lawyer. They can help you determine exactly what will stay and the things that will need to go. A major fear a lot people have, and one that prevents them from doing something that could help them, is that everyone they know will find out they’ve filed. While figuring out who has filed for bankruptcy is public record, unless you are a movie star or a person of significant importance, chances are no one will ever know you filed unless you tell them. There is nothing to be ashamed of when filing for bankruptcy. Remember not to worry about anyone else when determining if filing is right for you and your family. It can be a lifesaver in tough times and you can’t let what anyone else thinks or says determine your path to financial freedom. It’s true that filing for bankruptcy is can be one of the worst things you can do for your credit. However, it can also be one of the best decisions you ever make for your health and peace of mind. It can help you start fresh, with a few exceptions, and rebuild your credit in a better way than you could have before. Bankruptcies can appear on your credit history for 10 years or more. But, you can still qualify to make purchases such as a house or car with just a slightly higher interest rate. You’ll still get plenty of credit card offers as well. Like it or not, those will never go away. Filing for bankruptcy is new territory for most individuals. But it doesn’t have to be a complicated process. Bolinske Law specializes in personal bankruptcy, including Chapter 7 and Chapter 13 filings. The first step when considering bankruptcy, is to speak to an expert. You can have a Free discussion with us where we can personally review your situation and let you know all of your available solutions. Schedule a Free consult by calling (952) 294-0144 or by sending us a message.